Humoral immunity is a major protective immune response against extracellular bacteria, and it functions to block infection, to eliminate the microbes, and to neutralize their toxins (Fig. 15-1A). Antibody responses against extracellular bacteria are directed against cell wall antigens and secreted and cell-associated toxins, which may be polysaccharides or proteins. The polysaccharides are prototypic thymus-independent antigens, and humoral immunity is the principal mechanism of defense against polysaccharide-rich encapsulated bacteria. The effector mechanisms used by antibodies to combat these infections include neutralization, opsonization and phagocytosis, and activation of complement by the classical pathway (see Chapter 12). Neutralization is mediated by high-affinity IgG, IgM, and IgA isotypes, the latter mainly in the lumens of mucosal organs; opsonization by some subclasses of IgG; and complement activation by IgM and subclasses of IgG. The protein antigens of extracellular bacteria also activate CD4+ helper T cells, which produce cytokines that induce local inflammation, enhance the phagocytic and microbicidal activities of macrophages and neutrophils, and stimulate antibody production (Fig. 15-1B). TH17 responses induced by these microbes recruit neutrophils and monocytes and thus promote local inflammation at sites of bacterial infection. Defective TH17 responses are associated with increased susceptibility to bacterial and fungal infections, with formation of multiple skin abscesses (localized infections). One cause of this disorder is mutations affecting the transcription factor STAT3, which is required for the development of TH17 cells. This inherited disease is called Job's syndrome (because patients develop skin abscesses, thought to resemble the pestilence visited on Job in the biblical story) or hyper-IgE syndrome (because patients have increased levels of serum IgE, for unknown reasons). Bacteria also induce TH1 responses, and interferon-y (IFN-y) produced by TH1 cells activates macrophages to destroy phagocytosed microbes and may stimulate production of opsonizing and complement-binding antibody isotypes. 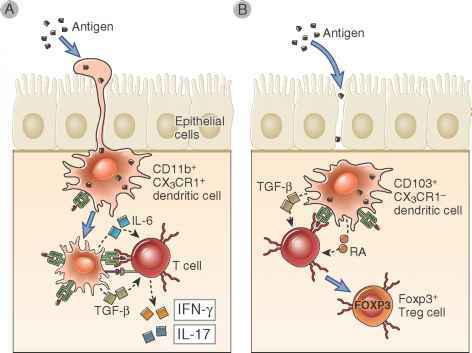 FIGURE 15-1 Adaptive immune responses to extracellular microbes. 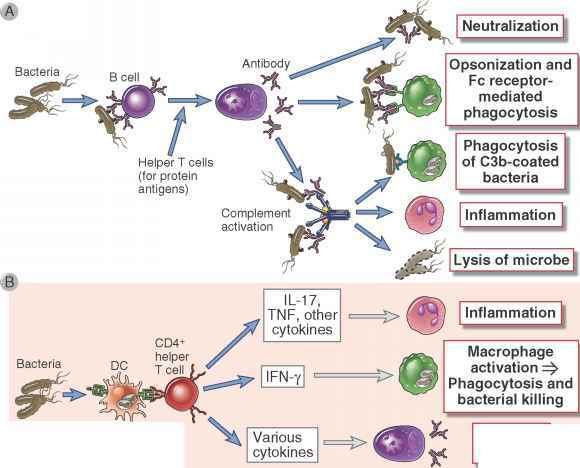 Adaptive immune responses to extracellular microbes such as bacteria and their toxins consist of antibody production (A) and the activation of CD4+ helper T cells (B). 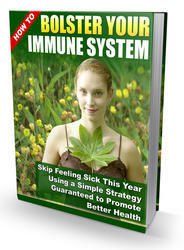 Antibodies neutralize and eliminate microbes and toxins by several mechanisms. Helper T cells produce cytokines that stimulate inflammation, macrophage activation, and B cell responses. DC, dendritic cell. The principal injurious consequences of host responses to extracellular bacteria are inflammation and septic shock. The same reactions of neutrophils and macrophages that function to eradicate the infection also cause tissue damage by local production of reactive oxygen species and lysosomal enzymes. These inflammatory reactions are usually self-limited and controlled. Cytokines secreted by leukocytes in response to bacterial products also stimulate the production of acute-phase proteins and cause the systemic manifestations of the infection (see Chapter 4). Septic shock is a severe pathologic consequence of disseminated infection by some gram-negative and grampositive bacteria. It is a syndrome characterized by circulatory collapse and disseminated intravascular coagulation. The early phase of septic shock is caused by cytokines produced by macrophages that are activated by microbial components, including LPS and bacterial peptidoglycans. Tumor necrosis factor (TNF), IL-6, and IL-1 are the principal cytokine mediators of septic shock, but IFN-y and interleukin-12 (IL-12) may also contribute (see Chapter 4). This early burst of large amounts of cytokines is sometimes called a cytokine storm. There is some evidence that the progression of septic shock is associated with defective immune responses, perhaps related to depletion or suppression of T cells, resulting in unchecked micro-bial spread. Certain bacterial toxins stimulate all the T cells in an individual that express a particular family of Vp T cell receptor (TCR) genes. Such toxins are called superantigens because they resemble antigens in that they bind to TCRs and to class II MHC molecules (although not to the peptide-binding clefts) but activate many more T cells than do conventional peptide antigens (Fig. 15-2). Their importance lies in their ability to activate many T cells, with the subsequent production of large amounts of cytokines that can also cause a systemic inflammatory syndrome. A late complication of the humoral immune response to bacterial infection may be the generation of disease-producing antibodies. The best defined examples are two rare sequelae of streptococcal infections of the throat or skin that are manifested weeks or even months after the infections are controlled. Rheumatic fever is a sequel to pharyngeal infection with some serologic types of P-hemolytic streptococci. Infection leads to the production of antibodies against a bacterial cell wall protein (M protein). Some of these antibodies cross-react with myocardial proteins and are deposited in the heart and subsequently cause inflammation (carditis). Poststreptococcal glomerulonephritis is a sequel to infection of the skin or throat with other serotypes of P-hemolytic streptococci. Antibodies produced against these bacteria form complexes with bacterial antigen, which may be deposited in kidney glomeruli and cause nephritis. Which of mechanism of adaptive response is involved in immunity to extracellular bacteria? How are extracellular infections eliminated?